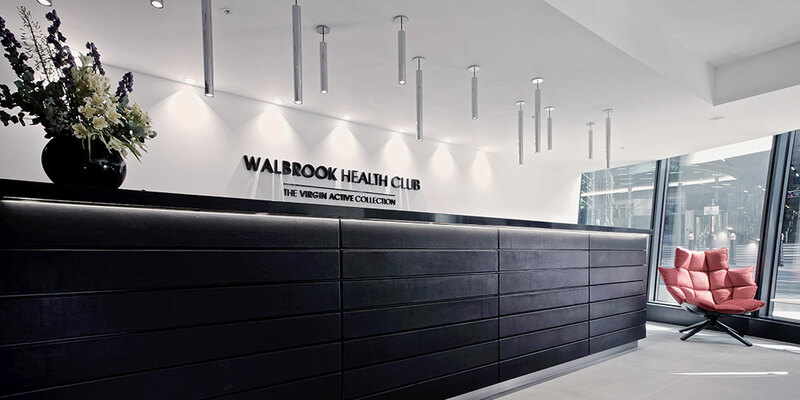 Virgin Active’s new Walbrook Health Club is located within the Walbrook Building, a landmark development in the City of London. The 2300m2 floorplate provides lounge facilities, a large gym floor, studios and luxurious changing areas with access to a spa centre. The brief given to lighting designers, Hoare Lea Lighting, was to adopt an integrated architectural approach. 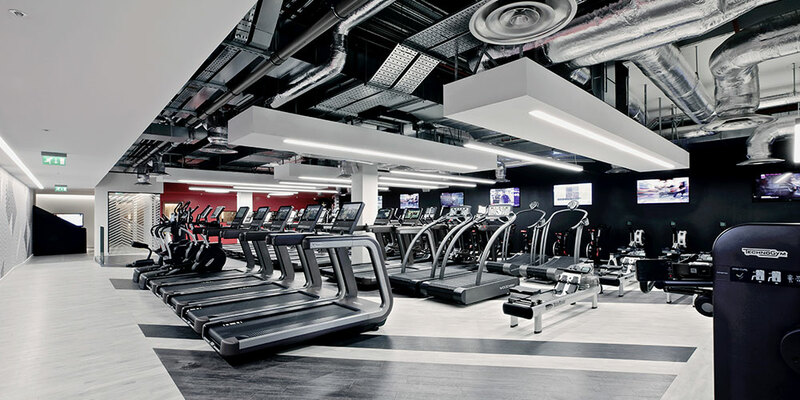 Optelma worked with Hoare Lea Lighting to create an all-LED design, to reflect the luxury of Virgin Active’s Collection brand. Visitors are immediately greeted by a calm atmosphere within the street level reception area. The reception desk features leather-clad front panels with a thin line of LED light, created by Optelma’s FIRO, picking out different textures. A feature staircase leads from the reception to the lower-ground floor. Light from the DRAD Micro, a linear profile recessed within the steps, adds a sense of theatre. In all the Optelma profiles specified, including FIRO and DRAD, Optelma’s exclusive OptaLED LED boards provide a stable, long-lasting solution, with superior colour consistency over conventional LED tape. 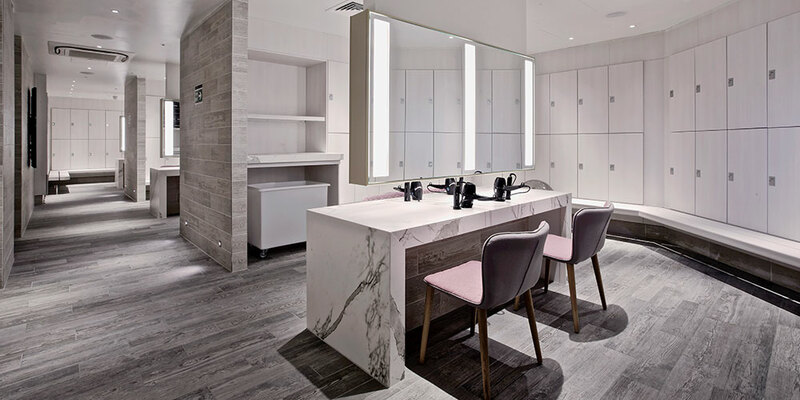 Within the changing rooms, integrated LEDs enhance the high-end feel. A linear profile, Optelma’s IKON, is incorporated into showers and behind the etched glass vanity units. Using Optelma’s micro boards, this IP65 lighting solution is also integrated beneath the units, adding glamour and bathing the table tops with light. In the open-plan cardio and weights studio, Optelma’s linear LED profile – QUAD – provides high-power lines of light in both suspended and recessed installations. This combines with disks of light from Optelma’s LORV pendants, which visually lower the ceiling line beneath the exposed services. Recessed lines of light in the weights zone complement the cardio area, creating an airy space with little glare. The walkway through the gym to the weights and mezzanine level is lit by a continuous thin 40m recessed line-of-light – the QUAD 55. This turns through 90 degrees to follow the walkway through the studio and into a corridor framed with further profiles. Within the ‘red’ corridor, goal posts of recessed QUAD create a feature that accentuates the ‘shrinking’ height of the corridor. The exercise intense Cycle Studio posed particular challenges. The desire was to evoke the cycling metaphor with circles of light to emphasis movement. However, low ceilings precluded the use of pendants and downlights were felt too pedestrian for the space. The solution was provided by Atelier Sedap’s Microblade Circles, which integrate into the shallow ceiling void and contrast dramatically with the dark ceilings and moody feel.